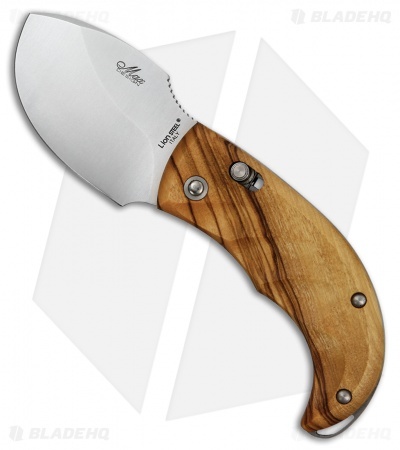 The LionSteel Skinner folding knife with Olive wood handle and 440C stainless steel blade is a fantastic tool for the hunter who needs a wide belly for processing their next trophy. Made from 440C stainless steel, the LionSteel Skinner takes a fantastic edge, is easy to resharpen and is highly corrosion resistant. Beautiful olive wood handles are sculpted for a solid grip in hand. The LionSteel O.C.S. Open and Close Security System locking mechanism ensures a reliable positive lock-up when in use. Corrosion resistant 440C stainless steel for easy maintenance. Sculpted olive wood handles for an attractive and functional tool. O.C.S. locking system for a strong, reliable lock up.